Tent cards, as the name suggests are prints shaped like tents, strategically placed on tables, desks, counters, etc. to catch the customer’s eye. They are attention grabbers. 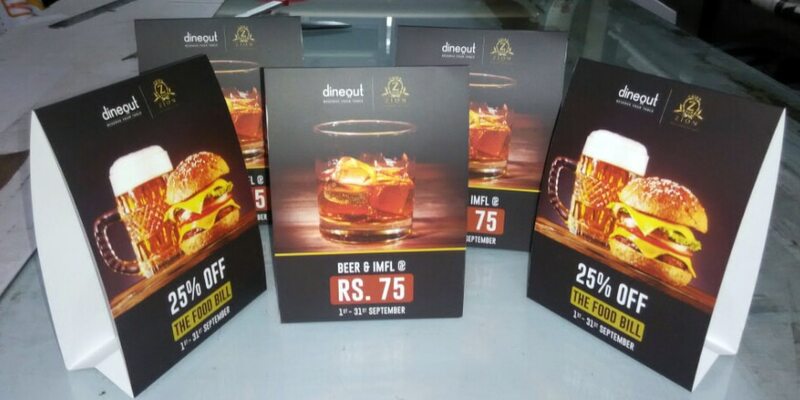 Tent cards as marketing tools are primarily designed to highlight a product, a service, a disclaimer or a discount offer. Walk into any upscale restaurant and you’ll probably see a double printed card standing by itself on in the middle of the table. This card is generally used to list the chef specials or highlight some unique offering of the establishment like free Wi-Fi or low prices like during designated happy hours. These prints shaped like tents have a flat stand beneath, which enables us to prop them up on flat surfaces. Tent cards’ primary application is to highlight a message right in front of a client’s face. When placed on desks or tables, the customer inevitably glances at them while they are waiting. Tent cards are economical and disposable. This makes them ideal for weddings, conferences, tables in hotels and dining places, point of sale desks, etc. You can use them in receptions to show seating arrangements. Alternatively they are used on sale counters to showcase discount schemes or highlight disclaimers. Cash counters have tent cards bearing a PayTM QR code or a VISA / Mastercard logo. This shows the merchants ability to accept alternate forms of payments. As mentioned earlier, tent cards are extensively used in restaurants to entice customers to a particular dessert option or a special dish recommended by the chef. An enticing food photograph and striking description of the culinary dish helps the customer quickly make up his mind. Tent cards, when viewed from the side, are shaped like a tent. Basically, we take a long and rigid card sheet and fold it horizontally in the centre. The artwork is digitally printed on both sides of the fold. The base is created by folding one end of the card is folded at 90 degrees. This fold is glued on to the other vertical section. 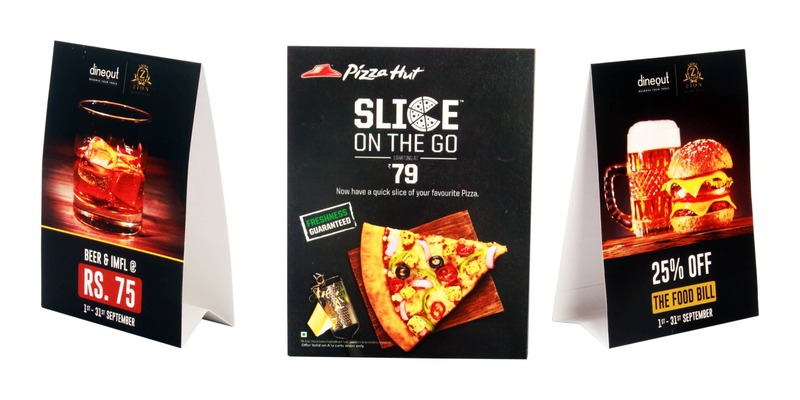 This flat base enables the customer to prop the tent card on horizontal surfaces like desks and tables. Since there are multiple creases involved in the fabrication of a tent card, we laminate the sheet to ensure that there no paper cracks develop along the folds. Moreover the flat stand at the bottom can be folded within itself. 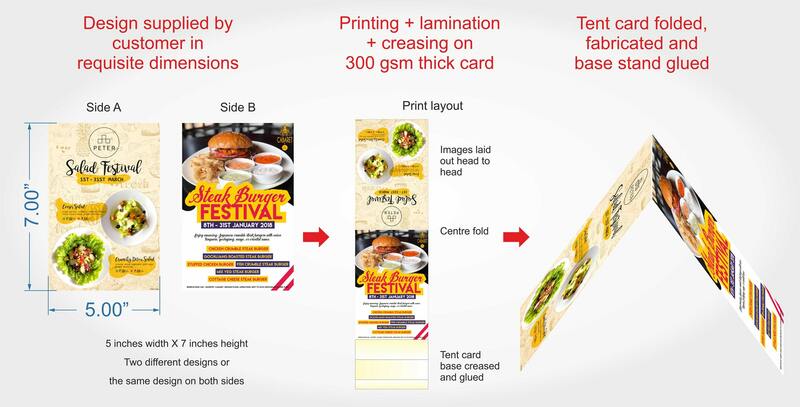 Thus tent cards can be shipped in fully flat condition. The standard dimensions for tent cards printed at Orchid Digitals are: 5 inches wide by 7 inches tall. All you need to is to give us two designs in these sizes. We then place these designs on the two sides of the tent card. Alternatively the same design / content can be reproduced on both sides.